Marshall safety Malik Gant (29) makes a tackle on an Eastern Kentucky running back during the first half of a Sept. 8 contest at Joan C. Edwards Stadium in Huntington, W.Va.
NORFOLK, Va. — An effort worthy of defeating a king. 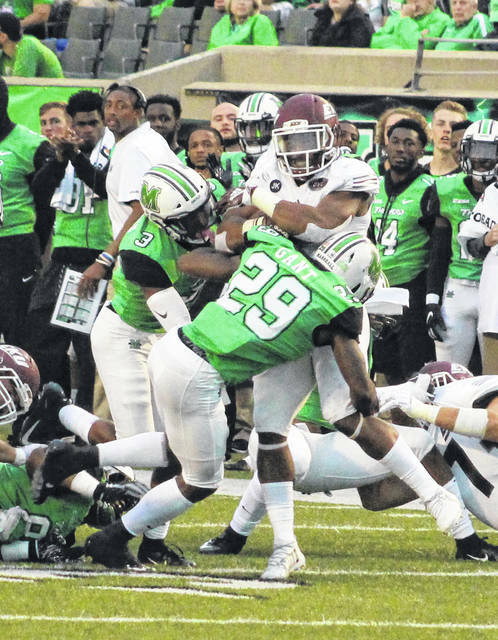 The Marshall football team churned out a season-best 319 rushing yards and led wire-to-wire on Saturday en route to a 42-20 victory over host Old Dominion in a Conference USA contest held at S.B. Ballard Stadium in the Old Dominion State. The Thundering Herd (4-2, 2-1 CUSA East) built leads of 14-3 at the half and 21-10 headed into the finale, but the guests saved their best for last after preserving their advantage with a ground-and-pound approach that worked to perfection. Through three quarters, the Green and White had yielded 147 rushing yards — but the Herd kicked into another gear down the stretch after producing three touchdowns and 172 rushing yards that turned a one-possession contest into a commanding 42-20 cushion with less than two minutes left in regulation. The Monarchs (1-6, 0-4) did manage to close the gap down to eight points twice in the fourth quarter, the last of which came at 28-20 with 5:01 remaining. Tyler King, however, broke off touchdown runs of 65 and 46 yards over the next three-plus minutes, allowing Marshall to seal the deal on staying unbeaten in road games this fall. King finished the game with 195 rushing yards and two scores on 22 attempts, while Anthony Anderson added three TD runs and 91 yards on 14 totes — all of which enabled the Herd to get out of the historic Hampton Roads metropolitan area with the triumph. The Thundering Herd claimed a 501-402 advantage in total yards of offense and finished the afternoon plus-1 in turnover differential. The guests also limited ODU to just 106 rushing yards on 31 carries, an average of 3.4 yards per attempt — compared to their own 7.1 yards per carry average on 45 rushes. Both teams went scoreless in the opening period, but the last of three turnovers in the game ultimately led to the first points of the contest. Malik Gant’s interception gave MU possession at its own 12 with 2:51 left in the first, then the guests marched 88 yards in 10 plays to secure what proved to be a permanent cushion. Anderson gave Marshall a 7-0 lead a minute into the second period following a 22-yard run. The Herd increased their lead to 14-0 as Tyre Brady hauled in a 3-yard pass from Alex Thomson, capping a 10-play, 60-yard drive with 8:33 remaining in the first half. Old Dominion answered with a 14-play, 55-yard drive that ended in a successful 30-yard field goal by Nick Rice with 18 seconds left, making it a 14-3 contest entering the break. Anderson extended Marshall’s lead out to 21-3 at the 5:31 mark of the third following a 4-yard scamper, capping an 8-play, 73-yard drive. The Slate Blue and Silver, however, answered with their first TD drive as Travis Fulgham hauled in a 1-yard pass from Blake LaRussa at the 3:29 mark, capping a 7-play, 75-yard drive that closed the gap down to 21-10. ODU strung together a 10-play, 70-yard drive that ended with a 41-yard field goal by Rice — allowing the hosts to pull within 21-13 with 12:40 left in regulation. The Herd countered with a 4-play, 43-yard drive that ended with a 4-yard Anderson TD run, allowing the guests to increase the lead back out to 28-13 with 7:08 left in the fourth. The Monarchs answered with one final score on their next drive as LaRussa found Kesean Strong on a 16-yard pass at the 5:01 mark, again cutting the deficit down to eight points. Marshall won the time of possession battle by a mere 1:12 over the course of 60 minutes, and the Monarchs also claimed a small 25-24 edge in first downs. ODU also had six of the 11 punts in the game and committed two of the three turnovers overall. Thomson finished the day 18-of-29 passing for 182 yards, throwing one TD and one interception early in the first quarter. Brady led the wideouts with 103 yards on nine catches, accounting for half of Marshall’s completions. Chase Hancock led the MU defense with 13 tackle and Chris Jackson was next with 10 stops. Frankie Hernandez also forced and recovered a fumble on Old Dominion’s opening drive of the game. Marshall also recorded three sacks and six tackles for loss. Will Knight paced the ODU ground attack with 70 yards on 11 carries, while Strong added 52 yards on 15 attempts. LaRussa finished the day 31-of-54 passing for 296 yards and two scores to go along with a pick. Isaiah Harper hauled in eight passes for 37 yards in the setback. Sean Carter and Justinn Richardson both paced the Monarchs with eight tackles apiece. Oshane Ximines added seven stops and also came away with both a sack and an interception. Marshall will try to end a two-game losing skid at home on Saturday when it hosts Florida Atlantic on Homecoming. Kickoff is scheduled for 2:30 p.m.